Frank Alexandre is so excited to make his point, he hip checks a table out of the way as he lurches toward the photograph on the wall. “Olhe! olhe!” he says, falling back into his native Portuguese. The picture, hanging in the Casa de Trás-os-Montes e Alto Douro, a social club in the Ironbound section of Newark, NJ, is of a clutch of sun-pummeled stone buildings, the roofs crenulated with scrub, the pavered road layered thick with dust. It’d be easy to dismiss the scene as a deserted corner of nowhere—how some have described the Trás-os-Montes e Alto Douro region in northeast Portugal—if it weren’t for the imposing, windowless stone structure on the top of the hill and two women sitting below in what little shade a straggly bush could muster. “This building here is the cookhouse,” says Mr. Alexandre, owner of a local auto repair shop and towing company. “There are four or five stone ovens inside.” He explains that in times gone by, the members of the town would forage for scraps of wood, build a fire in the ovens, and cook communally and successively: hotter fires roasted meats and baked breads while cooler embers burbled stews and braises and coddled eggy desserts. When the cooking vessels were finally pulled from the ovens, families divvied up the food and trekked home to dine. “That,” he says, tapping the picture, “is how we survived.” Satisfied he made his point, Mr. Alexandre goes behind the club’s bar and pours Favaios, a Moscatel from the fertile southern part of the region which hugs the Douro River. Nearly six decades after that photograph was taken and half a world away in Ironbound, where 25 percent of the population is of Portuguese descent, the tradition of communal cooking and eating remains—especially during Páscoa, or Easter. “Last Easter I sold about 120 whole lambs, 60 kid goats and almost as many suckling pigs,” said Herminio Lopes, who owns the Lopes Sausage Company in Newark, one of the area’s most popular meat suppliers (he has also shipped sausages to the White House). He explained that because home ovens can’t always accommodate a whole animal, the Portuguese-preferred way of roasting, many animals are brought to restaurant kitchens, where they are marinated or massaged with a customer’s own rub, then roasted and either enjoyed in the dining room or taken home for the Easter celebration. Other people dress the roasts themselves and cook them outdoors in hand-built brick ovens. On a ride through the city and nearby Elizabeth, Mr. Alexandre pointed out small backyards co-opted by hulking ovens—the Portuguese equivalent of the American charcoal grill—in which, he said, it wasn’t unusual for one cook to roast not only his own family’s Easter dinner but those of several neighbors. In the early 20th century, waves of immigrants from Portugal and the Azores settled in the Ironbound district, and by the 1920s the community had its first social club along with churches and retail stores lining Ferry Street, the neighborhood’s noisy thoroughfare. Midcentury saw another boom, which was eclipsed in the ’70s and ’80s by immigration from former Portuguese colonies, including Brazil and Cape Verde. Although the Luso population has decreased because of relocation to the wealthier suburbs and restrictions on immigration, most Portuguese families in the area still cleave to the Catholic church, religious festivals and feasts. A different business model of roaster-for-hire is Valença, a restaurant in Elizabeth run with precision by its owner, Martinho Pereira. His crew cranks out several hundred roast suckling pigs during the holiday season for in-house customers, catered events and families who prefer to dig into their pig in the privacy of their own dining room. 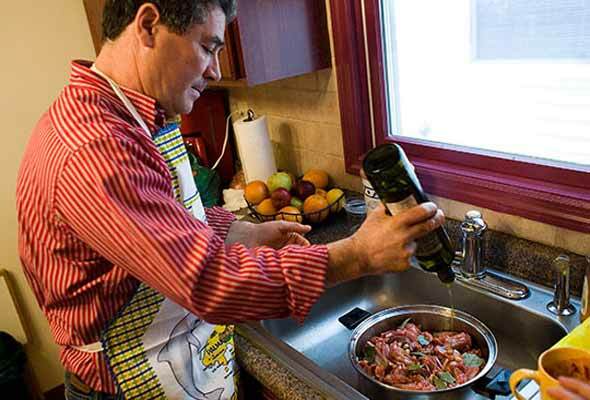 When asked what secret ingredients make his pork so popular, Mr. Pereira laughed and shrugged as if to say, “What secret?” Like most Portuguese roasts, his suckling pigs are coated with nothing more than lard, garlic, salt and black and white pepper. “Everything is better with olive oil!” Mrs. Alexandre shouted as she rubbed some into the lamb legs. Mr. Alexandre countered with voluminous and rapid-fire requests for bowls, pans and cutting boards. Their frantic pas de deux continued, and they dipped and spun to avoid elbows and sharp knives as they whirred garlicky pastes in the food processor, peeled potatoes and dressed the meat. In under 45 minutes, four pans along with a flan were ready for the stove. 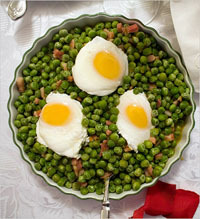 Ervilhas com ovos, a staple of peas and bacon topped with poached eggs, would be made right before dinner. Mr. Alexandre is no stranger to the kitchen, as he’s proud to announce, having won several contests at the social club for his folar, a traditional Easter bread that in Trás-os-Montes is stuffed with cured meat. “I made the mistake of teaching one of the young men from the Azores how to make it,” he said, “and that year he won.” Mr. Alexandre is determined to win back his title this year. A short time later, half a roast suckling pig from Valença and both lamb dishes were nestled in the center of the Easter table. Potatoes, rice, bread and the egg-topped peas filled the gaps. Around the table sat 10 hungry guests. Dinner was suddenly interrupted by the bleating of Mr. Alexandre’s cellphone. A Portuguese woman was stranded on the highway and called for a tow. He stood up, popped another chunk of lamb into his mouth, and shrugged on his jacket. Photos © 2009 Christian Hansen. All rights reserved.